Visit the Water Quality page for information including annual and monthly water quality reports. Get everyone out of the building or area. From a safe location, call us at 402.554.7777 or 911 from a phone not located in the building. There is no charge to check gas leaks! If you smell an odor or know there is a damaged gas line, do not use any matches, candles, lighters, flashlights, motors or appliances. Don’t even use the light switch, telephone or cellular phone. If you detect a faint odor of natural gas, check the pilot lights. If the pilot light or burner flame is out, shut off the gas supply to the appliance. Allow ample time for any gas accumulation to escape before relighting. Have your natural gas appliances, heating system, chimney and venting systems inspected every year by a qualified heating contractor. Use a clean filter. Standard air filters for furnaces need to be cleaned or changed once a month, more often during the heating season. Newer filters may be washable or require less frequent changing. Check the owner’s manual. If a pilot light or burner flame goes out, allow ample time for any gas accumulation to escape before relighting. If the problem continues, call M.U.D. at 402.554.6666, or your heating contractor. Gas appliances and furnaces need fresh air for proper combustion. Combustion products need to be vented to the outdoors. Keep flues, ducts and vents attached to appliances and heating systems in good condition and clear of obstructions. Do not use gas ovens to heat a room or for any purpose other than cooking. It could be dangerous to your safety and may damage the range or oven. Teach children about safety around all household appliances. Each gas appliance has its own shut-off valve. Know where each is located and how to shut it off in case of a suspected gas leak. Call at least two working days in advance, and ask for a “locate.” Utility representatives will locate and mark all underground (gas, water, electric, phone, cable) lines. There is no charge for the service. If you damage any underground facilities during your excavation, call 811. 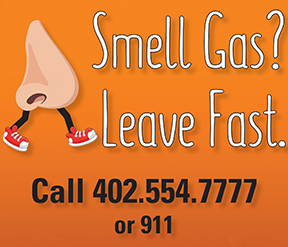 If you smell natural gas, leave the area and from a safe distance, call 911, followed by M.U.D.’s 24-hour emergency number: 402.554.7777. If water lines are damaged, call a licensed plumber. In the event of a disaster, turn off all gas appliances as you would if you were leaving your home -- like the stove, oven, gas fireplace, etc. If there is a situation where gas needs to be shut off, M.U.D. will take care of it, and keep customers informed via the news media. An uncontrolled release of natural gas may result in fire, explosion or suffocation. 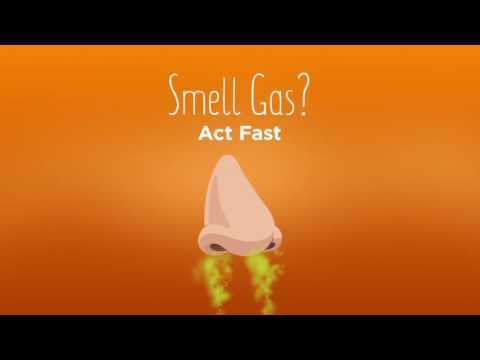 If you have a decreased sense of smell, you may want to buy a "natural gas sensor." Most models are available for less than $60. They are easy to install and they monitor carbon monoxide, methane (natural gas) and propane. The unit should have the UL (Underwriters Laboratory) seal of approval. What should you do if you are experiencing symptoms of CO?